So, really, what is the difference between AdSense and AdWords? The biggest difference between AdSense and AdWords is in who uses the system, who the primary audience is. AdWords: The Google AdWords program enables you (an advertiser) to create advertisements. Advertisements that you create through AdWords appear on relevant Google search results pages and also on sites that participate in the Google AdSense network. 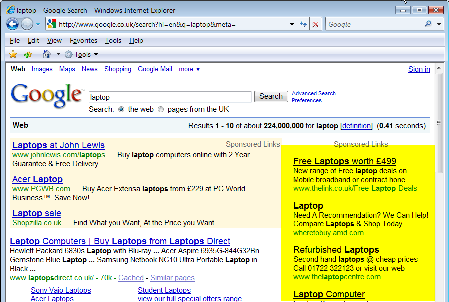 Google AdWords is Google's proprietary advertising platform that generates for example those text-only ads on the right hand side of Google Search results as highlighted in the print screen below. Google AdWords is a pay-per-click advertising program where you bid on keywords and write ads. These ads then appear on Google when people type in those keywords and do searches. When someone clicks on your ad, you pay Google however much you bid on the keyword. AdSense: The Google AdSense program enables owners of web sites (aka publishers) to display AdWords ads on their web sites. AdSense is a program that lets Google put AdWords ads directly on your web site. In other words, AdSense is Google's syndication program for its AdWords ads. Any AdWords ads that are displayed at (we say "syndicated out") at third party web sites do so via Google's AdSense program. That means that the ads seen via the AdSense program are AdWords ads posted on third party sites. The Google AdSense program delivers Google AdWords ads to individuals’ web sites, and Google then pays web publishers for the ads displayed on their sites based on user clicks on ads or on ad impressions. When someone clicks on the ad on your site, you make money (see Make money with AdSense). AdWords are the ads. AdWords is an advertising program to create more exposure for your site. Users of the Google AdWords program are called advertisers. AdWords bring your site instant traffic. AdSense is the syndication program. AdSense is a monetization technique that you can use to help your site generate some extra money. Users of the AdSense program are called publishers. Ready for some more details? The difference between AdSense and AdWords prices is Google's profit. For example, if you log into the AdWords interface, you will see that you have to pay certain amount for each click that is executed on your ad campaign, let's say it can be $2.00. You have to pay $2.00 to Joe Smith that runs the web site where someone clicked your ad. Then, if you also have a website and run AdSense on it, you can see that you get for example $0.05 for a click on a banner on your site. You get $0.05 from someone that advertises his business on your web site when a visitor of your web site clicks the ad. $2.00 what you pay in AdWords versus $0.05 what you get from AdSense. Pretty nice profit margin, isn't it? What you get and what you pay greatly varies. The difference can be 10 cents as well as 5 dollars, and there is a number of factors that affect it. You may be getting 5 cents for AdSense clicks and paying 10 cents for AdWords clicks. Or, you may also be getting 50 cents for the same AdSense keyword and paying 5 dollars for the same keyword in AdWords. Why? and how long the visitor stays on a site. There are probably many other factors in play, but these are the most important ones. AdWords price: If you have a keyword in AdWords that is very expensive (let's say $30), it can mean one important thing. It is very unpopular. Such word must be set somewhere within the Google system as being a CTR-killer. That means that if that keyword is in a particular AdWords ad group in conjunction with certain other keywords or in conjunction with the particular wording of the ad text, historical data shows that that campaign fails miserably and gets no clicks. That is why you have to pay more in AdWords as an advertiser. And again, the price of Google AdWords is affected by geographic factors. If you are looking for cheap AdWords (let's say 5 cents a peace), you could try to put target AdWords in less competing countries in your industry. Some experts say that geographically Japan, US, and Canada host the most expensive AdWords. Can I use AdSense income for AdWords campaigns? This is another difference between AdSense and AdWords. Google AdSense and Google AdWords are two completely separated departments, so you cannot transfer your AdSense income to your Google AdWords account as of now. Your only option is to send your AdSense income to your bank account and then transfer it from your bank account to your AdWords account to pay for your AdWords campaigns. How to make enough money from AdSense to cover AdWords costs? In other words, is it possible to drive traffic to your site through Google AdWords and then make more money on that traffic from Google AdSense to cover your AdWords costs and yet have some extra? Yes and no. Setting up a scheme like this requires a lot of expertise, depends on many factors, and only experimenting with various strategies in this area can answer the question. The difference between AdSense and AdWords prices is what makes this impossible in general. However, there are some tricks to this. In general, if we talk about a keyword or key phrase (for example "web hosting"), you would pay much more for visitor's clicks on your AdWords ads than you would receive from when someone clicks the same ad on your site. What you can do is to drive traffic to your site through low-cost keywords in AdWords (for example "president") and then monetize the traffic through displaying more profitable keywords or phrases and AdSense ads (for example "Mesothelioma"). Example: Set up a Google AdWords campaign with the word "president" or something relevant to your site but cheap (you have to choose keywords relative to your website to drive traffic in). You might be paying some 50 cents for clicks that bring visitors to your site. Have your site about some presidents having the Mesothelioma decease with ads targeted at "Mesothelioma". You might be getting some 1-2 dollars for your visitors' clicks on the ads on your site. Voila, you are making money. Even if you can't cover your AdWords costs with your AdSense revenue, there still may be some benefits to driving traffic to your web site through AdWords which is a hidden difference between AdSense and AdWords observed by webmasters experimenting in this area. Even if traffic from AdWords does not generate profit it helps to boost your CTR possibly helping your click value over time. The traffic of your website gets affected by your AdWords campaigns, and the effects greatly depend on many factors. There is a difference between AdSense and AdWords in how they technically work too. AdWords: You create a Google AdWords account and link it to your credit card. Your account will be ready once your credit card is approved. Then you set up your advertisement and determine the maximum amount you are willing to pay per click on your ad. Every time someone clicks on your ad, Google bills your account. When your bill reaches a certain amount, Google charges your credit card. Do you have questions about any of this? Ask them in our SEO discussion forum. If you like this article, please, tell your friends. See the resources below.